I remember very clearly a promo for BBC Digital featuring a lot of 0s and 1s, narrated (I think) by Richard Wilson and Angus Deayton which actually managed to make the whole thing sound a million times complicated than it was. Can't seem to find it online anywhere even though it was played at practically every junction. All this talk of BBC digital promos reminds me just how many campaigns there were in that first decade. There was the famous 'scary' floating heads one, then an equally troubling series of ads involving people tearing off thier own faces to reveal BBC stars underneath, plus one involving puppet monkeys which in no way had any connection to the ITV Digital monkey. Apparently. Sure there were plenty of others in those early years, too. I know what you mean about choice though. With four or five channels, it was easy to choose what to watch. When you've got hundreds, finding the good stuff is more of a challenge. That is, somewhat ironically, why I still find something like the 'Radio Times' useful. Its easy to catch a promo for an upcoming (series) but one off programmes are easier to miss, and magazines / websites are good for picking out the new and / or interesting. At a glance they are highlighted and you can have a quick look to see what's coming up. I still find that easier than scanning through an EPG. Then there are likes of TiVo or Sky Q that start to learn the things you like and point you towards them. The other factor is that you learn the channels that are likely to offer things you're interested in. For example I know that programmes I'm going to ejoy are likely to be on one of just a few channels. I know I can safely ignore the vast majority of channels, but if they do happen to show something I'm interested in (like the 'Michael Palin in North Korea' programmes on Channel 5) its often highlighted by the Radio Times or a similar magazine / website. I can then record it and so when I want to watch something (that isn't a live sporting event) its there in a list infront of me. My housemate at the time bought an IDTV and it had the ONdigital menus etc, just in a different colour and without the On logo. My parents did have a onDigital/ITV Digital box for a while. The only problem was that the signal would be interrupted by other appliances, like microwaves. The reception was quite poor and muddy, so I believe they only got Sky because they would've gotten it free at the time, killing onDigital in the process as well as the pirate cards. I think the reason onDigital/ITV Digital collapsed was because they were desperate to win the monopoly on digital TV and desperate to get more coverage of football, when really what they should've been doing is focusing on their software and their packages. There were loads of campaigns, all slightly overlapping, advertising digital in general, digital paid for services, digital channels, digital equipment etc etc. Yes - I also enjoyed spotting how the suggested cost of a Freeview box dropped over the decade of promotion. "...from around £150" dropped down to "£100", "£50" and eventually "£20". 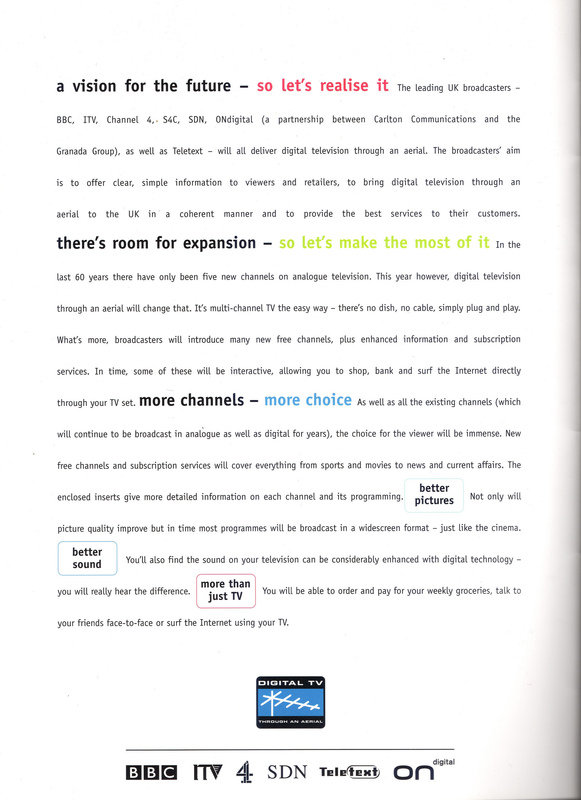 I was absolutely fascinated by the launch of Freeview at the time - I was 10 when ITV Digital collapsed, and remember the release of that Pace FTV box just before its collapse, and then had just turned 11 when Freeview came along. I remember reading about it on the BBC News website, and have just dug up this comment thread which I remember well: http://news.bbc.co.uk/1/hi/talking_point/2373775.stm - some of those who said that Freeview would never take off were rather mistaken!! As for my Freeview history, it was in December 2003 that my parents first got a Freeview box (a Sony VTX-D800U, which was a great box for its time) and then we moved over to BT Vision not long after its launch in 2007. And that's where my parents have been ever since (with the odd box upgrade in that time - they now have a YouView one). As for myself, I've stuck with a vanilla Freeview since leaving home, with the odd Now TV and Netflix month thrown in via IPTV. So with all the old adverts, nobody remembers...BBC QUIRKE? Meanwhile here in Ireland we didn’t get DTT for another 12 years, and it still only carries ten channels. I have a newspaper TV guide from the On Digital launch week which has a wraparound promo for the launch, sadly it's in a box up in the loft right now, so I can't get it down to take scans of it. Can anyone lend James a stepladder? Are they the same scans as on the MHP Private Parts? Could download them and upload them here if you want.